Well, it's a month since my last post but time seems to have gone backward. We lost 20 degrees along the way and my early potatoes got frosted (yes, the old sages proved right, a layer of plastic was not good enough against decades of experience). This was snapped in the 3rd week of March after the unseasonal warm spell left us. Can you see the lighthouse through the haar which rolls in from the North Sea? It's no wonder this was needed at the mouth of Aberdeen Harbour. As an aside, it was designed by Louis Stevenson who was the grandfather of Robert Louis Stevenson. Meanwhile inside, on my windowsill, my tomato and pepper plants are so big that little natural light gets past them; the tomatoes are like triffids. I have nearly caught them growing a few times but they're too smart for me and only do it when I'm not looking; I have flower buds on my chillies. The idea was that they moved from boiler cupboard to windowsill to greenhouse in a seamless progression but night temperatures in the greenhouse are so low that they and the toms are stuck at second base. Did I say that this blog was not for those who wanted to learn anything? Unless of course you count learning from the mistakes of others. Like learning not to start plants in artificial heat in February in North-East Scotland unless you have the heated space to grow them on in. But enough of the gloom and doom. I watched a pod of dolphins at play in the harbour mouth (no camera with me to record). I say at play, but is that too anthropomorphic? Perhaps someone better informed than I am can explain to me what the attraction is of the fresh water of the river mouth. Is it more practical than playful, maybe to get rid of sea lice? The therapeutic effect of dolphin watching puts things in perspective. I'm sure in a few weeks or months, what seem like set-backs now will fade into insignificance as the garden moves into growth and the potatoes, undeterred, find enough remaining energy to throw new shoots. Dolphins and potatoes - what an inspiration! 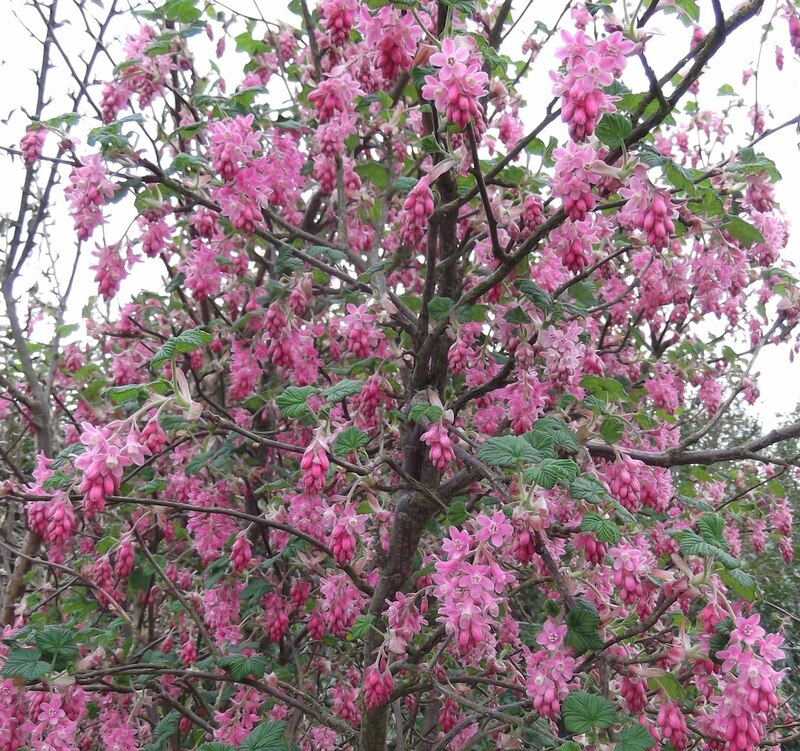 For me it is not so much the date of the vernal equinox that heralds the start of Spring but more the blossom of the flowering currant. March 20th could easily pass me by but with the currant bush in full view as I have my breakfast, it is for me a more insistent reminder. 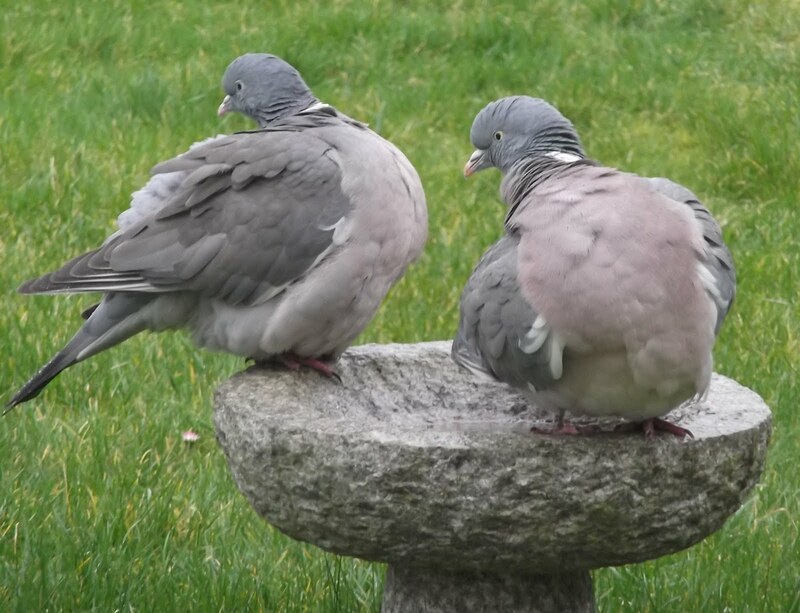 As if to labour the point two besotted pigeons visited my bird bath this morning. It is too small for twin, pigeon-sized bathers even if it had water in it - which it didn't. These two were using the perch as a rendezvous for mutual admiration and a precursor to consummation I'm sure. Meanwhile, down on the allotment It was one of those March days when the sun shines hot and the wind blows cold: when it is summer in the light, and winter in the shade. - Charles Dickens. Nevertheless the early potatoes were planted, about two weeks ahead of what is considered safe around these parts but I have planted them in a bed which has been covered in a plastic tunnel, and which has gone back until things warm up a bit more. Question: Why do people ridge up their potatoes when they plant them? I've never understood the logic of this. Mine are in small trenches. As the foliage grows the soil from the ridges between the rows will first level out the trench and then a ridge will be built. Is my logic flawed? What's the significance of the red circles? These mark the random seven tatties which have what I call nutrient bombs (completely organic I promise) planted and ready to detonate a few inches below them. I want to see if there are any differences in the growth and harvest of these plants compared to the others. I'll post progress photos as the season progresses. What's in the nutrient bombs? That's for another day. It's bad enough here situated as we are right by the shore. Gales can wreak havoc with standing crops at any time of year. But in thinking about gaining an edge, or at least not losing one, I'm focusing less on the really violent gales which there is little we can do to alleviate, but instead on the lesser but persistent winds which we maybe underestimate because they don't actually blow our plants away or break stems. 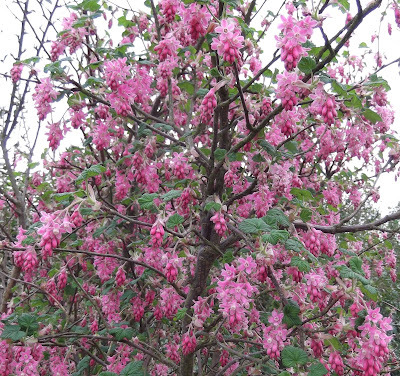 The desiccating effect of continuous winds slows growth and can interfere with flowering and fruiting. But the most vulnerable plants are those juniors in spring who haven't much experience of life's hardships and have to contend with that lethal combination - cold temperatures combined with wind. Joy Larkcom, in Grow Your Own Vegetables, mentions research showing that protection from even light winds can increase yields by up to 30%. Hey, this is no small increment; this is a giant leap, or would be if it's achievable. To do that we need to consider all sorts of strategies: windbreaks (living or artificial) at the edge of gardens; covering crops with permeable material or plastic; arranging plantings so that larger and sturdy plants offer protection to smaller and more tender specimens in their lee; later plantings; careful varietal selection and so on. In vulnerable gardens we probably have to use all of these to a greater or lesser extent. The problem with covering individual plantings seem to be me three-fold; a lot of work is involved in repeatedly laying and removing covers, there are costs involved, and, let's face it, they are not very attractive are they? Here are two beds of winter tares planted in October as green manure. As an experiment I covered one bed with what they call 40% windbreak netting. Although not clear in the photo, underneath the netting there is more bulk and therefore more value in the green manure for digging in composting. But the small gain came at the expense of the netting and the labour of the structure. So I'm working on other fronts that might be easier to manage. At the other end of the plot, facing north, I'm hoping to sap the wind's determination with netting and ropes. The beneficial effects of slowing down the wind can extend up to ten times the height of the windbreak. That covers the whole length of the plot if I can get the right balance. Too much of a barrier and the wind will push it over or jump over and flatten the plants. But this is a work in progress. I'll need to go through a year's growing cycle to get a better feel of the problem and how I can adapt to it. One thing's sure: the garden will look a lot different by the end of the year. But will my brassicas be horizontal? The biochar samples arrived from Oxford Biochar (Biochar Experiment). What we are required to do is to grow a crop of our own choice in two adjacent square metres of soil, identical except that one of the two mini-plots has biochar added. Today I have prepared two beds on part of one of my new raised beds and added the biochar to one of them. Although I won't be planting for a few weeks yet, by preparing them now I am giving the biochar a chance to be 'primed' by the soil organisms and the compost that I added (to both plots to maintain equality). Oxford Biochar didn't indicate if their material has gone through any priming process. When I submit my results I'll make sure that I record the length of time the biochar has been in the soil prior to planting. I know from reading about other biochar experiments that sometimes results which show no positive, or even negative results, from biochar application are explained by the fact that 'fresh' biochar has been used. The application rate recommended by Oxford Biochar is 1.5Kg (the bag you see in the picture) per sq. metre. That is the equivalent of about 6 tonnes to the acre (15 tonnes/hectare)and is at the mid to lower end of recommended agricultural application rates, certainly not excessive. There could be a rise in PH. This could be marginally helpful for some crops but my PH is generally OK for most things I am likely to grow. Biochar can help with drainage on sticky soils but my raised beds are fine in that respect. On the other hand they can also help retain moisture. In a dry summer that could be helpful. If I do see growth differences in this experiment I expect that it will be these latter characteristics which will be at work. I'll have to wait and see but there is one observable characteristic of biochar which is immediately obvious - the albedo effect. I hope you see in this picture (click to enlarge) how the biochar, although mixed into the soil, has left enough on the surface to darken it. My soil is a dark loam anyway but the additional darkening affect should retain that little bit more heat, valuable at this time of year as the soils struggles to heat up. Of course there is one more important variable - what to grow! I might try to squeeze as much as possible from the experiment and plant to different veg, perhaps a root crop and something leafy. Carrots and lettuce? These past few days here in the North-East of Scotland we've had a bit of weather reversal with our English neighbours. Usually we are colder but while England has been coping with freezing rain and records lows we've had some balmy days. Is 11ºC (52ºF) balmy? From where you're sitting maybe not, but for us in February it's almost enough to tempt you to indulge in a frenzy of planting. Bad mistake, which I resisted because I am surrounded by old hands who have seen more snow falls in April than snowdrops in January and who are guided by dates not ephemeral warm spells. If global warming is kicking in these guys will need 20 years solid data before they'll plant their early tatties before the end of March. So instead of premature outdoor planting I took advantage of a calm day, a warm sun and a tide which had left an offering on the strandline to collect some seaweed. The shore is a five minute stroll with the wheelbarrow. The view is looking back upstream to the harbour but it's also the outfall for the River Dee and so although this is tidal there's a huge volume of fresh water passing this point too. That makes me think that the seaweed I am gathering may be lower in salt. Advice seems to vary about whether seaweed needs to be 'washed' before using. I'll take a chance with my composted, 'lo-salt' harvest which I'm using here to top off a compost bin. I don't have to be convinced of the value of seaweed but I was intrigued to read, again in Gardenzine, that some bloggers complain that the flavour of Ayshire's famous potatoes has declined since a lack of available labour to cart seaweed on to the potato fields has meant that this traditional fertiliser is no longer used. More pejoratively, it was seaweed that underpinned so-called 'lazy-bed' agriculture in Ireland and the West coast of Scotland where the low fertility of peat-based soils were supplemented by the nutrients supplied by spread seaweed. The term lazy-bed seems unfair both to the crofters and the seaweed as it was probably the most productive solution to a poor soil and an easily available resource. And I know that even with my relative proximity to the source, carting seaweed from the shore to the land is not for the lazy. With the harvest put to bed in the compost heap and given its covering blanket the sun disappeared in a darkening sky and a few snow flakes flurried in a bitter wind. The seasonal temperatures had returned. The tools went back in the shed and I was pleased to have kept the seeds in their packets for the time being. OK, it's not a brilliant drawing, I concede. Let me explain. I doubt if any of us have a garden or allotment which is perfect in every respect. We all have to work round limitations of one kind or another - soil, aspect, shading, wind, temperature, builders' rubble. Your gardening limitation is the biological equivalent of the slowest ship in a convoy. What is slowing you down? For me, I know it's not the soil - deep, free-draining in the raised beds, reasonable PH. But give me a longer a season and another 5° on average temperature and I'm sure I could double the yield I'm expecting. Some things we have to accept; others we can squeeze a little. Things I Have To Accept No. 2 My plot is on a north-facing slope. Things I Have To Accept No. 3 Average annual temperature 7.9 °C (46 °F). More Small Increments to follow. Dundee is only the first stop! There's plenty still to do at the lottie. But biting winds some days, frozen soil others, are slowing me down. It does give me the chance to some reading though. 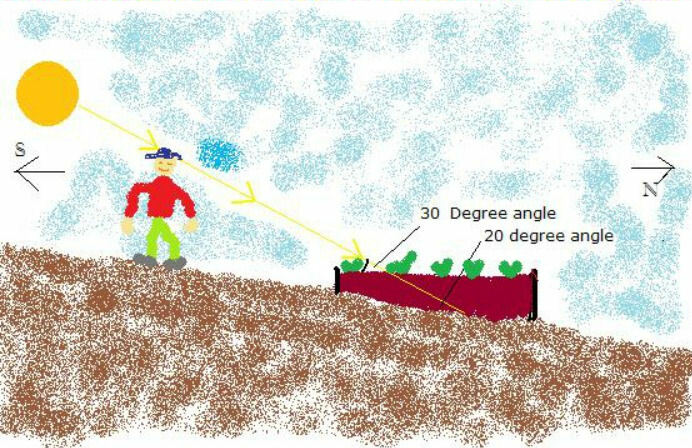 I'm not a scientist but enjoy reading explanations by scientists or experts in a particular field about how things work, or, in the case of soil and growing healthy plants, what exactly is happening at the microscopic level and what we do can encourage natural processes to function most effectively. Of course, you have to choose your sources carefully and, for me, approach every explanation and piece of advice with a healthy dose of scepticism. I'm old enough to have seen scores of 'facts' in the fields of nutrition, health, medicine and plant husbandry proved wrong. Most of us now accept that: blood-letting is not a cure for illness; formula milk is not better than breast milk for babies; homosexuality is not a disease. Too obvious? How about: margarine is not better than butter for your health; having high cholesterol is not a reason for not eating eggs; chocolate does not cause acne. But in farming and gardening, despite some progress in some countries towards the recognition that organic systems are good both for the environment and personal health, many millions of growers world-wide are still being duped by powerful forces to believe that inorganic nutrients added in liquid or granular forms combined with remedial use of herbicides, insecticides and fungicides are a legitimate and sustainable way to grow crops. But it is precisely because I know how easy it is to persuade when the listener is sympathetic to the argument that when I read about organic growing I don't necessarily want my beliefs to be re-enforced, I want them to be challenged. It is just as possible for 'received wisdom' which is actually nonsense to be handed down as fact in the organic world as it is in the non-organic arena (still chitting potatoes? - maybe wasting your time!). That is why I relish the two papers, both available free online, which I have been absorbed in these last few days. Both, in different ways, have challenging things to say about compost and its value. Both are written by people who are undisputedly supporters of organic systems so I don't doubt their credibility on that score and I am prepared to respect their viewpoint and listen to what they say. I know that both will make me think harder about the complex biology of living soil systems. Can You Have Too Much Compost? What is the rationale behind Steve Solomon’s belief in the limitations of composting? This links to Chapter 1 of his paper but the challenging material is in Chapter Eight. Is It Minerals We Need? Q. You were saying Organic farming and gardening aren’t really working. How are they not working? I need to get my soil in such a condition that I can plunge my arm in up to the elbow and risk having my hairs ripped off by earthworms before I can feel able to question the value of compost but while I'm waiting for my humus and worm population to build up I'm quite happy to read this kind of stuff. I might even be able to have my own opinion one day!